Sanu Siddharth Aka Siddharth Sharma is a Blogger and Entrepreneur from a small town Bisauli of District Badaun (U.P.) India. His entrepreneur skills came to the forefront just after completing his 10+2 education. Apart from studying he runs OnlyLoudest.com, a Blog where he share his experiences on how to blog, and teaches people about Internet Marketing and Search engine optimization (SEO). He believes in delivering quality to costumers and making five-figure income from Internet Marketing and Blogging. His aims high and perceives to make it big in the startup arena. Currently he is working hard in Marketing field and saving for startup. Soon he is going to start something interesting that will be helpful for people of India. OnlyLoudest is a Blog and Internet Marketing company where you can learn about “how to Blog”, “SEO (Search Engine Optimization)” and Internet Marketing using Social media and Search Engines. OnlyLoudest is one of top 50k sites in the world, according to Alexa. Recently our Team tried an experiment with SEO and AdSense and Made Approx $6000 in just 5 Days. We also provide services of website development, search engine optimization and marketing. We only deliver quality result for our customers and never sell fake promises. Because earning trust is more important than money. Actually, I started my blogging career with a Magazine Based tech blog where I covered all new updates in technology world. Then afterwards I faced many problems that SEO is not easy for everyone, so I asked to some top bloggers to share some tips with me. They did not reply to me although seeing my message, so I quit that blog and started working with a ‘How to Blog’ Magazine. It is currently known as OnlyLoudest where I share only those tips and tricks, which I used personally. 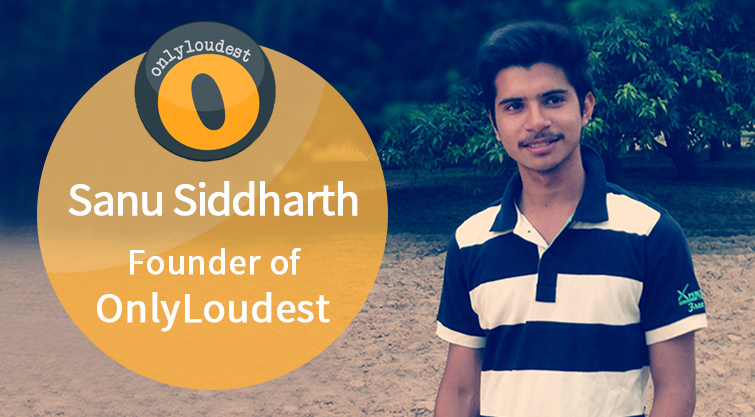 After starting OnlyLoudest, I met many bloggers through social media like Ankit Singla , Harleena Singh and Harsh Agarwal. These guys are really awesome and helped me a lot to learn everything about blogging and Marketing from my experiments. Try, Try and Try, But Don’t Cry! After thinking about this though “Never Give up” is also very important to archive something in our life. Aha! My Life is totally filled with Challenges because my Family belongs to Middle class and they believe in completing your study then finding a Govt. Job. But my thinking is to do what you love doing, and I want to do something my own like launching a startup and taking it to the next level. In my blogging Life, I faced many challenges because of the Updates in Google and some changes with Facebook for marketers. Still now we are growing and learning from the experiences and one of the best thing of my team is that we never think about Loss. We always think about giving 100% to work. I don’t do anything special but as I told you that I love my team and they give 100% to each project. Till now we are getting success and delivering quality result for costumers. This is totally self-funded website, but now we are collecting funds again to invest in OnyLoudest for taking it to next Level. Actually Big businesses are built from Big Ideas not from Money. First think about a Big Idea which should be interesting and should be helpful for people, then think about money. Actually this is not a 9 to 5 job. I am running my own business and work from home so there is no reason to affect with brain drain. One must absolutely love what he’s doing, complete knowledge about work which you are doing and Self-confidence. Mostly I love Google Tools GMAIL with some add-ons, Google Analytics to track your work and Google Keyword Planner. If you also want to run a blog then I recommend you to start with Blogger (free Hosted) platform then after you can migrate it on WordPress (Self Hosted) platform. I love to read Success stories of Entrepreneurs and love to read about their failures because failures tell us more than Success. I love to try experiments then share with my readers. Yes! I‘m so lazy and wish to change it. Arise, Awake and do not stop until the goal is reached. We should start any work with Confidence. Because confidence to do a work is one of the most important key of success. Of Couse! Same answer because everyone wants to grow his/her business. So same here we wanted to be on top for Internet Marketing. I will focus on my study and will find a Govt. Job as my parents wants.